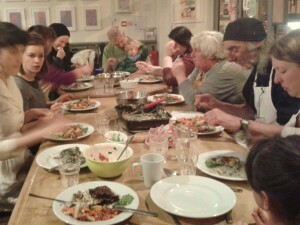 Home » Tasty Tuesday cooking sessions are back! Tasty Tuesday cooking sessions are back! Recommencing on 7th of October, the Tasty Tuesday sessions will be happening on the 1st and 3rd Tuesday of every month! Join in from 6:30 – 9pm to cook tasty treats together then sit down with everyone to enjoy a freshly prepared evening meal. Make new friends, learn and share new recipes. Cooking together has proved to be a wonderful community activity, come along and be inspired. £2.50 contribution is required to cover the costs of ingredients. Sessions are held at 178 Cafe on New Cross Road, SE14 5AA. Please bring your own apron and teatowel, plus tuppaware for any leftovers. Hope you can join us! Just come along on the night, or email tastytuesdaySE14(at)gmail.com if you have any questions. Previous PostCome and Cook with Grow Wild this Year!